According to one patient’s story detailed on the SynCardia website, Jim Hennigan “looked and felt too healthy to be in the hospital” while living with the Total Artificial Heart and the Big Blue hospital driver. 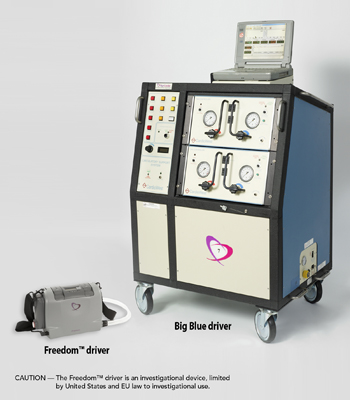 Now, SynCardia is working with Bimba Manufacturing and Smart Products to develop the new Freedom™ driver system, which is designed to allow stable Total Artificial Heart patients to leave the hospital to wait at home for a matching donor heart. “The Freedom driver is designed to be the world’s smallest pneumatic driver for powering the Total Artificial Heart,” says Bob Guillemette, Chief Engineer at Bimba Manufacturing. 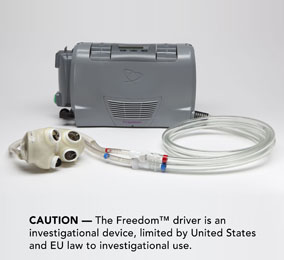 The Freedom driver utilizes a proprietary pump that sends pulses of low pressure air to inflate the two diaphragms in the Total Artificial Heart, which pump the blood. This produces high cardiac output through both the left and right ventricles of the Total Artificial Heart. The Freedom driver is designed to run on a household current, a car battery, and its own rechargeable batteries.